"Working with MERGE has been exceptional, we challenge each other to come up with creative solutions." Salus Global Corporation (Salus) was developed through the combined investiture of the Society of Obstetricians and Gynecologists of Canada (SOGC) and Healthcare Insurance Reciprocal of Canada (HIROC). Salus enables greater patient safety performance by healthcare professionals and the teams they work within by delivering high-quality programs that identify and address the needs of those teams in improving their inter-professional learning, communication, teamwork, and culture. Having redeployed the MoreOB Program portal using the MERGE platform in 2008, and several projects since, MERGE and Salus have developed a highly beneficial relationship allowing new products, content, designs and functionality to be built and brought to market quickly and efficiently. Salus was looking to extend their highly successful product line and came up with the idea to re-use and re-brand portions of the MOREOB content and functionality to deploy a new product called “MOREEX”. The MOREEX Program would allow Salus to sell a similar offering to non-obstetrical departments within hospitals. The MOREEX portal would re-leverage most of the existing functionality from the existing MOREOB portal, as well as take advantage of several new pieces of functionality and an entirely new design layout. Salus approached MERGE with the MOREEX opportunity and solicited advice as how best to proceed from a development standpoint. MERGE and Salus decided that the best way to proceed was not to develop the MOREEX portal as a separate website, instead it was built on top of the existing portal. The advantage was that the new product would automatically inherit all existing functionality of the MOREOB portal. As well, any new functional modifications would automatically apply to both product lines. This also allowed for all content to be managed under the one platform. MERGE modified the login process so that when a user would login via any of the MOREOB or MOREEX URL’s, they would automatically be redirected to the appropriate content sections based on user credentials. The site would also automatically be skinned seamlessly to look like either the MOREOB or MOREEX Program, so it would appear to be two different websites with two different URLs. 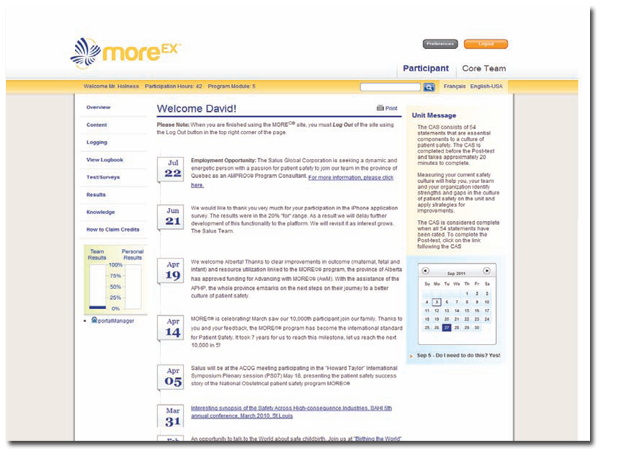 The MOREEX design changes ended up being so well received, that after launch, they were applied to the existing MOREOB Program portal as well. The MOREEX product launch has been yet another in a string of successful partnerships between Salus and MERGE. Both teams were able to work together quickly and efficiently, to launch the product on-time and on-budget. The MOREEX Program has allowed Salus to extend their existing product line and helped widen and diversify their revenue stream when selling to hospitals.